Want to see the latest Cowboy Pictures? Unfortunately, our cook has informed us that she will be unable to cook for us this year. Therefore, breakfast will not be available before the match, and we will not be serving lunch during the match. We will shoot through all six stages with no lunch break. Please plan accordingly. This month (April) we will have hotdogs available after the match for a small fee. We are not sure at this time if we will continue with the post-match hotdogs after April. An Associate Membership is required to shoot at any event at Sandusky County Sportsmen's Club, including Cowboy Action Shooting. One-year associate memberships can be purchased at the monthly match registration table for $32. Only one associate membership is required for each family. This membership is valid for the entire calendar year. 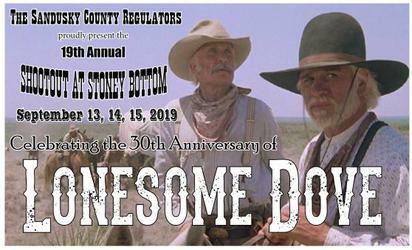 Here's how it works: At your first match of the year at Stoney Bottom, you purchase the associate membership for $32. Your first and second match that year are FREE. There are no other charges other than the associate membership fee. Your third, fourth, and all subsequent matches that year will cost you only $10 each. Those shooters that are already members of the Sandusky County Sportsmen's Club do not need to purchase an associate membership, and will pay $10 for each match. Our own Catlow will be hosting an "Introduction to Wild Bunch Matches" clinic to be held immediately following our June 8th match at Stoney Bottom. 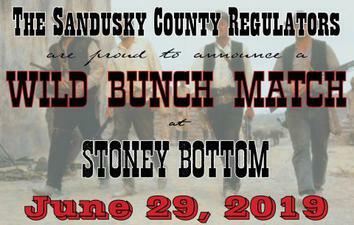 This is a great opportunity for those of you planning on shooting our Wild Bunch Match on June 29.